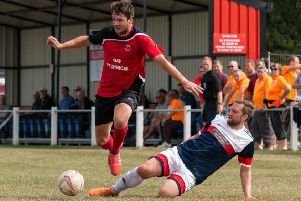 DROP-BALL DUEL -- the referee is too close for comfort as derby rivals Blidworth and AFC Mansfield battle for FA Vase honours. Relieved AFC Mansfield survived a potential banana-skin when shading derby rivals Blidworth Welfare in an FA Vase tie that was a fine advert for local football. In a thoroughly entertaining game that could have gone either way, Blidworth belied their status on the non-league ladder to give a scare to a Bulls team who play two levels higher. But AFC called on all of their experience to emerge with a 2-1 victory that earned them a tie in the Third Round away to another Nottinghanshire rival, Hucknall Town, which will mean an emotional return to Watnall Road for their skipper Chris Timons. The winning goal came just five minutes from time when Ollie Fearon raced clear on a break and fed Jimmy Ghaichem who, in turn, found Gary Bradshaw. The ball eventually reached Ryan Williams, who controlled before firing home from 12 yards. Chances had fallen at both ends in a blistering start to the tie. But it was underdogs Blidworth who snatched a 39th minute lead when an inswinging corner saw Tim Gregory dip to head past ‘keeper Jason White in the six-yard box. The second half was barely two minutes old when AFC levelled. A Williams free-kick was won by Timons and the ball looped up for Fearon to nod home from close range. Blidworth suffered a real blow on the hour when goalkeeper Steve Smith had to go off injured after a three-man challenge involving one of his defenders and Timons. AFC almost capitalised immediately as Fearon crashed a header against the bar from Williams’s cross.